The world is currently witnessing a wave of autocratisation, and yet over half of all countries remain democracies. These are the results of the first long-term study of democratisation and autocratisation since 1900. Three waves of democratisation, each followed by a wave of autocratisation: this is the overall story of global political development from 1900 to 2017 as shown by political scientists Anna Lührmann and Staffan Lindberg in a new study. Lindberg is director and Lührmann vice-director of the V-Dem Institute (“Varieties of Democracy”) at the University of Gothenburg: the biggest international research project on measuring democratic quality; some 3,000 researchers around the world are involved. The graphic below presents their latest findings: the progress of democratisation (broken grey line) and autocratisation (thick black line) over the last 117 years. 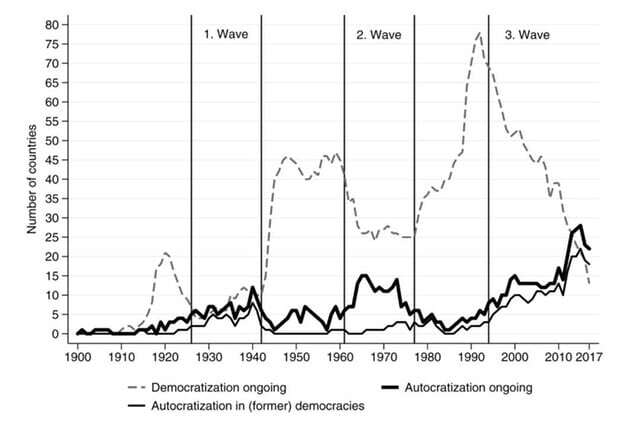 The current third wave of autocratisation has new features, the authors say: while earlier autocratisation took place in countries where such movements were already in progress, this one is happening mostly in democracies. In other words, while in earlier “classic” waves autocratic regimes came to power through foreign invasions or military coups, today the process is subtler and more gradual, and often camouflaged by legal changes. The archetype of the current autocratic crop is Hungary’s strongman leader Victor Orban: after coming to power through democratic elections, he set about overriding civil liberties and bringing opposition, media, and civil society to heel. Nevertheless, Orban is still bound to stand for re-election, and several parties are represented in the Hungarian parliament. Thus, rather than a classic power grab, the V-Dem authors speak about a “gradual autocratisation under a legal façade”. International sanctions, which can be effective as a reaction to military invasions or coups d’état, are much more difficult to implement because of these legal smokescreens. The helplessness (at least until now) of the European Union faced with its anti-democratic member state is a clear sign. The report authors describe autocratisation as the inverse of democratisation: a process that unfolds gradually and in which power is concentrated in the hands of one strong leader, who often claims to understand the “will of the people” and to govern in its name. Fundamental rights such as press freedom and democratic principles like the separation of powers are often ignored in such regimes. Most autocratic leaders try to extend their leadership mandate beyond any restriction; some claim the right to govern for life. “The third wave of autocratisation is real and endangers democracies,” Lührmann and Lindberg conclude. According to them, almost every case of autocratisation in a democracy in the past has led to the countries turning into an autocracy. “Very few episodes of autocratisation starting in democracies have ever been stopped before countries become autocracies”, they write. They nevertheless say it would be a mistake to fall into alarmist panic; despite the widespread and gradual tendencies being seen, the foundations of democracy remain robust. The current moment is still better than the past: in 2017 V-Dem counted 33 “closed” autocracies – states including Angola and North Korea. In 1980, before the fall of communism and the iron curtain, around half of the world was made up of such regimes. “The global increase in levels of democratisation should thus work to inhibit the rate of autocratisation,” the authors write. One indicator of the current state of affairs will be the upcoming European Parliament elections due to be held on May 26. Across the EU, nationalist and populist parties have promised to vigorously take the fight to traditional parties from the centre and left, which they aim to decisively weaken. V-Dem researchers examined 182 countries through the period 1900-2017. In these 117 years, they recorded a total of 217 autocratisations in 109 countries. Two-thirds of such cases happened in states already displaying autocratic features, one-third in democracies. Some 47 countries are involved in the current third wave of autocratisation. The author is editor of #DearDemocracy at Swissinfo.